Those who have maintained a consistent meditation practice for some time understand that the benefits are self-evident, and really need no explanation. For many of us, though, there is a constant struggle to ‘find’ time in our days to simply sit down and meditate, particularly if we work stressful jobs or long hours. This, however, is just a mindset. What we need to begin to see is that meditation is actually more important than our work lives. We know we have to make meditation a priority, we need to convince ourselves why. 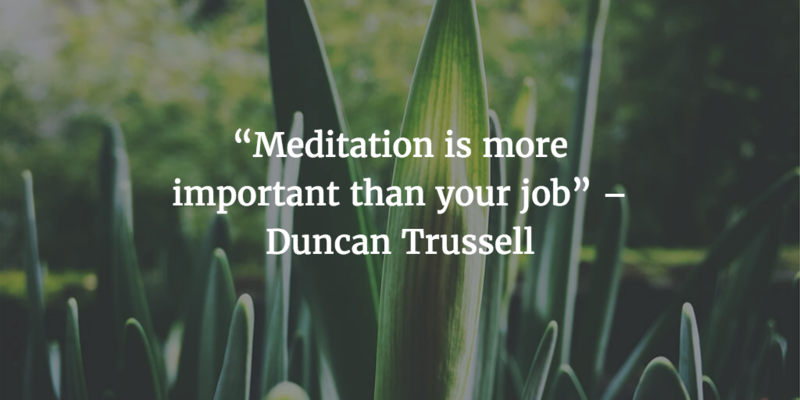 What follows here are 6 reasons why meditation is actually more important than your job. When you reflect on these ideas, you’ll start to understand exactly why a meditative practice should be one of the most important priorities in your life. A 2014 study by the conference board found that 52% of workers are unhappy at work. Other studies have had similar findings, with a leaning towards more unhappiness amongst the millennial generation. The reality is that most people aren’t actually finding much satisfaction from their work. If we compare that to studies of long to meditators, we see that those who are happier because of meditation practices are effectively 100%. However, hundreds of short-term studies of 8 to 12 weeks have shown a similar trend. While a job may introduce you to a lot of people, it often won’t truly improve our social skills. This is because it puts us in an unnatural environment (often competitive) in which we stand to lose something if we don’t maintain a particular image. Meditation reduces (and can completely eliminate) any social anxiety you have, it also improves your ability to empathize and notice subtle social cues, as well as your listening skills, by allowing you to be more engaged in the moment. Most hierarchical jobs will not teach you the skills required to be a good leader unless you are fortunate enough to reach an executive position. Meditation, on the other hand, will naturally lead you to develop the psychological resilience, detachment from outcome, and decision-making capacities that are necessary for leadership positions. A number of high profile CEO’s from Richard Branson to Steve Jobs and Mark Echo have highlighted the enormous impact that meditation has had on their businesses. One common issue with many jobs is that there are repetitive and not engaging enough. While most people mistakenly think that you need to find your passion to find fulfillment in your work, the reality is that you just need to find the right degree of challenge. This means something that pushes you, but not enough to cause lasting stress. Unfortunately, most jobs struggle to offer us the right balance, and therefore we either end up bored or stressed. Meditation not only exercises our brain enough to keep us engaged, it increases our resilience over time, allowing us to enjoy a progressive challenge that – according to the reports of meditators with over 50,000 hours of practice – is essentially limitless. While a job will provide you money, it won’t fix any unhealthy relationship you have with money. In fact, what it will likely do is make it worse. It’s natural that the more time you spend invested in a job, the more your brain will become wired to value the rewards of the work. This is why we so often see people who are close to retirement age and unwilling to stop working and let go of income, even though they are a lot more financially comfortable than they were in their 20’s and 30’s. Conversely, Meditation decreases your attachment to money, and all the stresses and fears that go along with it. Ironically, this may actually result in you increasing your earning potential. Whereas most jobs, particularly if they are desk jobs, take from your health – while providing a salary that can cover medical costs – meditation actually improves your health, eliminating the need to go to the doctor in the first place. There are a number of studies that suggest that mindfulness can help with a variety of health-related factors, one of which is the management of glucose levels and protection against diabetes. Though we all need to earn an income to keep food on the table, if we begin to see meditation as a real priority in our lives, the benefits we experience can be truly life-changing. Would you like to learn strategies to help you bring mindfulness to work? We’ve found simple mindfulness practices can make a huge difference, and we want you to benefit from them the same way we have! Ben is a freelance writer, and the co-creator of Project Monkey Mind – a blog for the 21st-century worker who wants to take control of their mind, smash through their limitations and lead a life worth living.